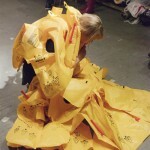 Security Blanket (2009) is a performance where Mellor sewed together 16 aviation life vests in the form of a quilt. 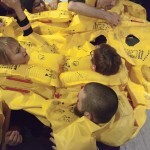 After entering into and inflating the first vest herself, audience members were invited to join and collaborate in inflating the entire quilt. 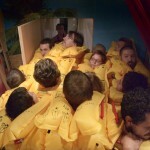 Once all 16 vests were occupied and inflated, the group attempted to navigate towards and get through the single door of the building’s emergency exit. Contrary to the instructions given on planes to help oneself before helping others, this piece requires a collective effort to reach the goal of safety.